Leave it to McNeil to deliver something as exciting as it is frightening. With her unique take on murder mysteries and exploring the unknown and most of the time, horrifying, I can always count on her for an action packed and somewhat bizarre read. 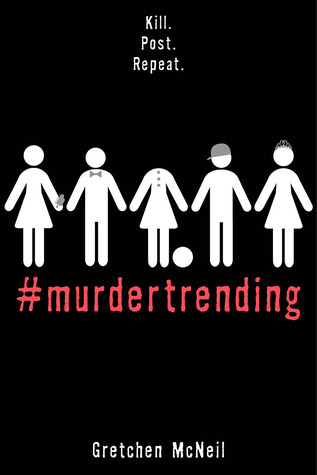 Set in a very much realistic time and place, #murdertrending was something that you could see happening today in a world full of social media and reality TV, which is also what made this such an interesting and hard to put down read. With twists and turns and danger literally around every corner, this was something fun and thrilling and completely different and I couldn't get enough of it. Fans and new fans alike, old and young, will all be able to get lost in this one and enjoy it up until the very last page. I clearly need read this one. It sounds really interesting, but also relevant. So glad you enjoyed it, Ali! oh great! I didn't know about this one. Glad I could let you know about it! I've enjoyed this author, and this sounds good. I like that it felt realistic. Oh wow, what a synopsis. It's sad to think our society isn't that far off from this reality. I know! That by far, was the most scary thing about it. That sounds like it would be exciting in a gruesome sort of way. The blurb really caught my eye. This author is popular with my teens especially my reluctant readers so I need to check it out. If they already like her, then I think they will really like this one. Definitely something appealing in that weird fascinating horror kind of way. Sounds fun! And yeah McNeil always gets my attention with a new book lol. You never know what she's going to come up with! I'm glad you liked this one. I SO want to read it! Do! If for nothing else than the utter uniqueness of it. I've never read this author before. It does sound a bit bizarre doesn't it? Not sure about this one for me, but I am glad you liked it! It was a bit bizarre for sure. OH, this sounds really interesting. I'm not a huge YA fan, but this is a genre of YA have I haven't tried much, so maybe. Great review.